There are two qualities needed in order to be a good Palm Sunday homily: 1) say something worthwhile about the events of Holy Week/the Paschal Mystery, and 2) be short. You'll have to judge whether this homily achieved the first requirement, but at least it pulled off the second one. Ideal place for reflection: what do we do? Little booklet is great on that. We might be tempted to assume it’s just a certain age range or a single gender. We will get you help. We won’t abandon you in this. But know that—because of our great love for you—we will fight hard against the thing that is tormenting you. He’s got tons of counselors to refer you to. Most likely, we would visit with you and send you to some trained to really start recovery. Even if you want to tell priests nothing and just get a referral: awesome. and it isn’t a message that stops at 14 or 18 or 22.
and probably with more casualties than escapees. There is one of those meetings for men right here in Wahoo every week. Could have one here. All you need is 2-3 people who will be honest and vulnerable and can meet regularly. SAnon: for, not the addict, but those affected by it—spouse, kids, etc. 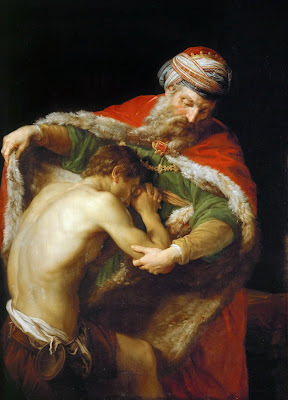 Lots of themes within the Prodigal Son. But the First Reading and the Psalm today suggest to us that the common theme of the day is God rejoicing over us, taking away our shame, and seating us at the great feast. And every Catholic should totally be able to connect those themes with the other traditional Prodigal Son themes of contrition, forgiveness, and mercy. Today is Laetare Sunday. 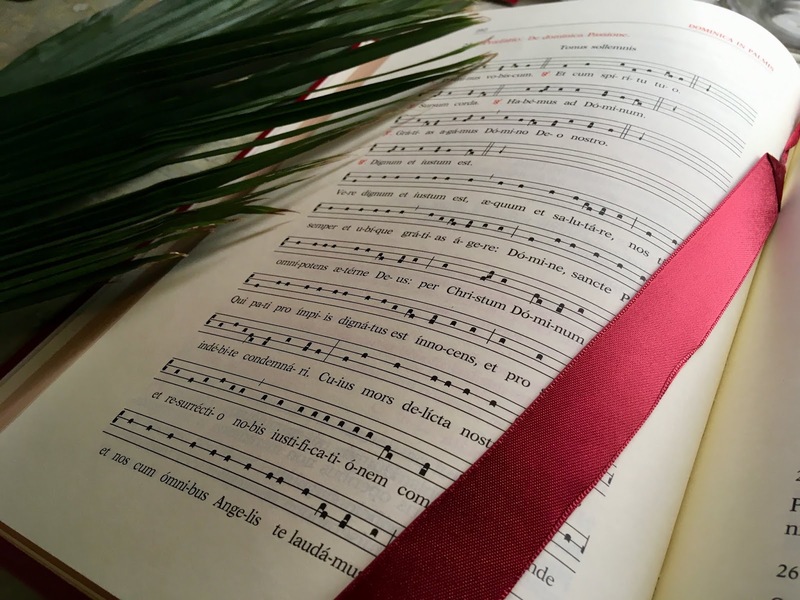 Today is a day of great rejoicing Laetare is one of those two Latin words we use for rejoicing: we have Gaudete Sunday in Advent and Laetare Sunday in the middle of Lent showing us we're over halfway through those two penitential season. So we wear bright colors, pretty colors, Rose colors and to say that we are we are in a celebrating mood. Our readings hit on that today so why don't you open up your missalette to page 81. Let's start with the gospel. The gospel of course we immediately recognize as the gospel of the prodigal son. And one thing you could pull out of the readings today is you could get this sense of reconciliation, because Paul talks about reconciliation in the second reading (I think he says we're about seven times). And there is only reconciling going on in an all three. I think the direct connection though between the first reading and the gospel —with bringing the responsorial psalm in tow— is the idea that: "What are we doing in those? We are rejoicing and eating —specifically feasting— rejoicing and feasting because the shame is over. Because our shame is taken away. So if you go to the second column there on page 81, and you go to that response of the father, fourth line down: "Quickly bring the finest robe and put it on him. Put a ring on his finger and sandals on his feet. Take the fattened calf and slaughter it." OK. So we are rejoicing. He has embraced his son. He's dressed him in the finest clothes. He's saying, "No son of mine will be shabby in my house." He takes away the shame. He says, "You're not going to walk in here in rags. They're not going to see "the dirty". <sniff, sniff> They're not going to smell the pigs on you. Right? He said, you know, your shame is going to be taken away. We're removing that. You're going to look like my son. You're going to be known as my son. Everyone's going to realize that my son is back. So he takes away that shame. And then they take the fattened calf and they go to slaughter it. And then we know [what happens]. What does the older brother hear as he comes in? Jump down halfway down; maybe a third of the way down. That beginning of the new paragraph there: "Now the older son was out in the field and on his way back as he neared the house he heard the sound of music and dancing." So again, we're not just eating and stuffing our faces. We are clearly having a loud, raucous party right. There's music and dancing. There's enough you can hear it all the way out in the field, enough that he is taken aback. And we know that he'll say later, "I don't see this kind of partying in my dad's house." Right? Jump down two thirds of the way there: What does he say to his father? "Look, all these years I served you. And not once did I disobey your orders. Yet you never gave me even a young goat to feast on with my friends." In other words, "This has not been a house of parties. This has not been a place of loud celebration. But you do it when this guy comes back? When this guy—who is shameful; who has done shameful things; who has shamed you and shamed our family by his choices; who's brought shame upon all of us by what he has done; who's been in the land of the Gentiles." That's why he smells like pigs, right? There's no pigs in Jewish Land. There's pigs in Gentile Land. You wouldn't have pigs in Jewish Land , right? [The brother] says, "He's done all of that and he then comes back and you do all this for him? "When your son returns who swallowed up your property with prostitutes, for him you slaughter the fattened calf." But we're told the answer, right? We're told: "Why are we rejoicing? Why are we feasting?" Because —fourth line from the bottom— "But now we must celebrate and rejoice because your brother was dead and has come to life again. He was lost and has been found. So the father takes away the shame. The father takes away all of that, and rejoices, and gives a meal. The three pieces, right there. Take away the shame, feast, and celebrate. All those [characteristics] are happening there in that story. Now before we immediately jump into the context of our lives, let's look back at the first reading. So jump back to page 79. We can read it initially as just: "Oh they're in the Promised Land finally. They're in the land of Canaan finally. They're getting to eat, and we could also read it as, "Oh it's a Passover!" They had the Passover when they left Egypt, and now they're celebrating it in peace, in prosperity, in the land of Canaan. They're showing that this is not a thing we're going to put away having just gotten out of land in Egypt. This is a ritual, this is a meal, this is a celebration, we're going to bring with us. But notice the context that God puts on that now-celebratory form of Passover. 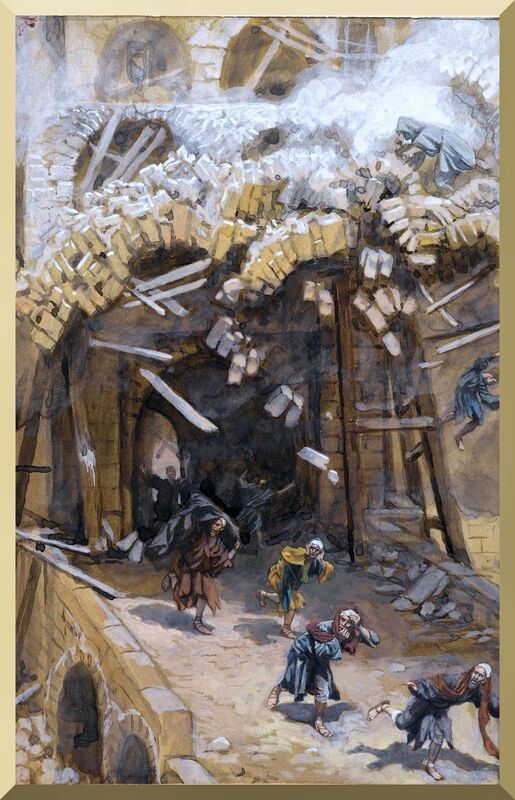 (The first Passover was with fear and trembling as the angel of death was going over the city, and they're hiding in their houses and knowing that something great is going on, and the blood of the lamb is on the door protecting them.) Now it is a celebratory thing, but God starts off by saying this: "The Lord said to Joshua, 'Today I have removed the reproach of Egypt from you." And then they go on to eat, right? So again they're feasting and celebrating because the shame is taken away. Now, their shame in the Exodus or their shame in Egypt is not as great as their shame, you know, five hundred years later in the Exile, when they have the Promised Land stripped from them. When God lets Babylon crush Jerusalem, scattered the people, and take them off to exile in Babylon. That was very directly for their sins. We're told that was because they refused to listen. They refused to let go of their false gods. They continued to rebel again and again and again. So God basically spanked them and then put them in timeout. That was very directly for their sins. Going down to Egypt was not so much that. It wasn't like they're directly sinned. I mean there's some of that: Jacob had twelve sons; ten of the twelve sons sell one of the other two down to Egypt. But that's not why they're in Egypt. We're told they're in Egypt really for God's purposes, and they lived there [peacefully] for 400 years. But if you've been in slavery, if you've been, you know, under someone else, and you're supposed to be this great nation, you couldn't help but have "reproach" as it says, by having that shame. You've been answering to someone else. You don't have an identity. You don't have a people. And actually they're lucky that they survived as a people. Which goes back to what we heard in the prodigal son idea: "Why are we rejoicing and celebrating?" He said, "Because what was once lost has been found; what was dead is now come back to life." The people of Israel would have felt like: "We were dead in Egypt. We had gone down there. We had lost ourselves. We lost our freedom. We lost our sense of identity, you know? We were basically nothing other than these slaves. We barely had a sense of ourselves, and now we've come back to life. Right. Israel's children are alive again and they're being brought in. And so how do they celebrate? With a meal, with the Passover meal. So this celebration comes in the form of: "Now we eat the Passover. Now we enjoy the work of somebody else's hands." Right? That's a fascinating line. Go on the right hand side, third line down: "On that same day after the Passover on which they ate of the produce of the land, the manna ceased. No longer was there manna for the Israelites, who that year ate the yield of the land of Canaan." All other years they'd have to do their own planting and taking care of the fields and all that. This year they didn't. Someone else had planted those fields and they got to enjoy the benefit. They got to reap with somebody else so. So God is basically lavishing them with different things in that year to say, "This is my rejoicing. This is my celebrating. This is my feasting with you as I take away your reproach.". And even on the responsorial psalm —go one page forward; go to page 80— we've got "Taste and see the goodness of the Lord." Food, right? We've got a sense of eating. But also this idea of celebration. Very first line: "I will bless the Lord at all times. His praise shall be ever in my mouth. My soul shall glory in the Lord. The lowly will hear me and be glad." So there we go again: rejoicing and celebrating and eating. And then jump down to the last response the third one: "Look to him that you may be radiant with joy and your faces not may not blush with shame." There's that shame again, right? God takes away the shame, takes away the reproach, and then brings us that joy and that feasting. And if you wonder if that's actually in reference to God saving action, it seems to be. Go to the second paragraph there go to the second line of that. He says, "I sought the Lord and he answered me; he delivered me from all my fears." So God is a deliverer. God as a savior. God takes care of his people. He released them; he brings them back up. So all of those [themes] are sitting together in our minds here. You know, we get a lot of different ideas out of the Prodigal Son. We get a lot of different ideas that come to us. But this is one that we can really connect with because we as Catholics know the experience of having been away from God and directly reconciling with him through the Sacrament of Reconciliation —going back and reconnecting to our father— and then being admitted to the table again. Being able to eat again, being able to come to the Eucharistic banquet, that feast, in order to do that. We know that feeling of celebration, right? We've all been there, right? You know you have been a confession in a long time; you go to confession; you walk out... <big exhale> because a weight is off your shoulder. You're excited like, "I wasn't able to go to Communion last week because I hadn't gone to Mass the week before that, and so I needed to get myself right with God." You know, we're excited to be able to come back to that table. And especially if it's been a long long time, there's that sense of: being the son, in the faraway country, living outside of the father's family, living in distance, maybe even feeling truly lost and dead, feeling like we're in exile, feeling like we're slaves to sin—all those things of a greater distance. And then here he comes. He doesn't ask questions. He doesn't say, "Where have you been? What'd you do with my money?" He says, "I receive you. I give you my mercy. I bring you back." And so we've had that personal experience. So it's good to see that it's not just, "God forgives us; God has mercy on us," but that it's connected directly to the idea of taking away that shame, that natural shame, that comes to us when we know we've done wrong. The idea of the father celebrating over us that allows us to celebrate, us to rejoice being brought back into the household. And then finally the idea that, "How do we do that? We're brought back to the table, back to the feast, able to eat again with our brothers and sisters, able to enjoy that celebratory feast and know that this is God's great blessing." So it's cool for us to see the full context of the parable back then, but also to apply it fully to our lives now. 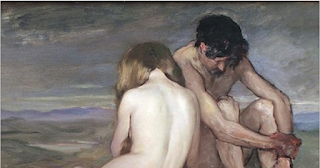 1st Sunday of Lent: Frank Sheed on the temptation. 2nd Sunday of Lent: Abraham, our father in faith. One comment I would add is that the homily for the 3rd Sunday is from the 7:30 AM Mass, and in other Masses I pointed out a few more connections to other readings. Like how the landowner would have chopped down the fig tree but will wait one year for it to essentially repent and turn away from its self-destructive path, which therefore parallels Jerusalem. 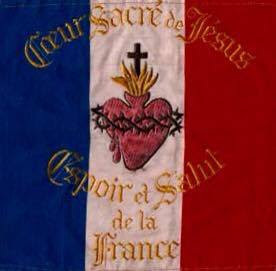 And in later Masses I split the Pauline critique into: holding to our own agenda ~ the Exodus generation's grumbling and dying, and then, pride ~ thinking you're standing secure; take care not to fall. I also delved deeper into how last week's story of the call and covenant of Abraham, followed by this week's revelation of the Divine Name to Moses, would be reasons that the Jewish nation looked down on the Gentiles and focused on their election and (national) righteousness before God. These are the things that set up Judea's "perishing as they did" and constitute the lessons we can learn today about agendas and pride. Lent and Easter are basically an ESPN "30 For 30" documentary of Jesus' victory. Big audio clips of the protagonist, real-time insights from the bystanders, interviews with the apostles years later, and a sweet highlight reel. It's one for the ages. This Lent I want to encourage you not just to give something up or do some extra act of Christ's love, but also to learn something from the documentary. Study, pray, engage your mind this Lent. Training our bodies is great, but maybe try a Lenten Bible study, read a spiritual book, or use the massive amounts of professional audio and video content on Formed.org (if you are in my parish, go to the bulletin and get our parish code and get on; it takes one minute to register.) Trade the kids 30 minutes of tv or games for a Formed show. Do it to yourself too: 50 minute drama on Netflix? Cool, now learn about the Christian faith on Formed or read your book. This year, our parish book studies are reading "Searching For And Maintaining Peace" by Fr. Jacques Phillipe. Nobody tells deeper truths in a more accessible way than him! Today I want to zoom in on just one line out of our letter to the Corinthians. The last couple of weeks we've been hanging around in 1st Corinthians Chapter 15. That's the long one on Jesus' resurrection. We've been getting lots of different thoughts out of that reflection there by Saint Paul. This is a famous line here and it seems like it's a quote from somewhere else. Paul tells us this: "[…] that the word that is written shall come about: 'Death is swallowed up in victory. Where, O death, is your victory? Where, O death, is your sting?' The sting of death is sin and the power of sin is the law. But thanks be to God who gives us the victory through our Lord Jesus Christ." So St. Paul, while talking about Jesus death and resurrection, is saying this is the victory and it's the victory over sin and death. Now, obviously we know that. We're Catholics, we've known that our entire life. But I want you to see how much victory is a theme that's used throughout the story of Israel and the story of the Scriptures: Even at our moment of greatest defeat, the moment of greatest failure—in the garden with Adam and Eve—already God was making a promise that someday there would be victory, someday there would be one who would stomp the head of the serpent, and that that one would come...some day. And then the rest of the Bible as the unfurling of this promise in action. When God's people are oppressed: when they're stuck down in Egypt—God acts and gives victory—victory at the Red Sea, victory through the Ten Plagues, victory over the Philistines, victory over their enemies and things like that. And again and again we see this image of victory. When Jesus comes proclaiming the gospel—what we have seen the last couple of weeks since the beginning of this year—he's proclaiming victory already. Remember this year started with him going into the synagogue in Nazareth and saying, as he reads this line about how captives are set free, a year of Jubilee is announced, and he says, "This is fulfilled in your very hearing." He's not saying, "I'm going to do victories." This is victory right now. "I'm doing victory. What we're doing right now: this is victory in your midst." And that makes more sense of what he does. What's he doing in all these little towns as he goes around Galilee? He's throwing parties. He's gathering people together and they're having parties right there. And people are even asking him, "Why aren't you fasting?" He's like, "Because this is a time of victory. This is a time of party. This is a time of rejoicing." And so he's hitting the idea of "This is victory." That's why it's so confusing then when he gets captured, when he gets beaten, when he gets denounced and scourged and crucified and killed, because you're like, "No no no no no. This is the victory guy, right? We’re the midst of a three year run of victory! What happened?" Victory fell apart (it seemed) on Good Friday. And that's what they go proclaiming everywhere they go. And Paul even goes and does it right under the nose of Caesar. All the little towns that Paul goes to in the Roman world? They're Roman colonies, meaning: Caesar dropped his closest companions, his soldiers, the most loyal people to him, in those towns like Phillippi and Corinth. And Paul shows up saying, "Caesar is not the king of the world; Caesar is not the victor over everything. Jesus is. Jesus is the victor and I'm here to proclaim his victory. That's my gospel—my proclamation, my announcement—that the victory has been won by Jesus, the Messiah, the Anointed, the king. And that's what the message of the Early Church is: that victory has been achieved. I bring this up because that's what Lent—and leading into Easter—really is. It's us coming back to the story of that victory. It's retelling it. Lent and Easter are like the "30 For 30" film of the story of Jesus. It's a mix of documentary footage—we get later reflections, with Peter being like, "I sure didn't think he was going to do it, and then dang, there it was!" You know? It's the apostles telling the story of their amazement. And then we get to see footage, we see clips, from the victory of Jesus. We see that moment on the cross where it seems like loss……Ope, comeback victory! Right? 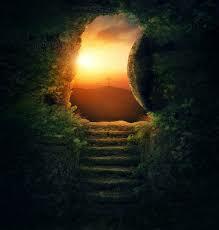 We see Jesus rising from the dead: "There he is! There he is in glory!" It's the highlight reel in the documentary of Jesus' great victory. That's what Lent and Easter are: telling us that story again, of the great victory. So now we're coming up on that. We're about to start our annual rewatching of that "30 For 30" —of that documentary again. We're getting ready to dive in. Next Wednesday is Lent. I don't think that I need to review for you all the Lenten stuff of which you got to do, what you're going to give up. You know, no meat on this day, and fasting on that day, and stuff like that. You can find that in the bulletin. But let's talk about what we can do to prepare. As we're getting ready for this season, as we're trying to choose what we should do, I know usually our first thought is, "What do I need to give up?" Candy. Chocolate. TV. Pop. Whatever. We're picking things, maybe as a family to give up, maybe as individuals. We're usually looking at that. And sometimes we look for extra things to do. What's the thing I can add? What's the thing I can do different? What's the thing that I can change in my life or do better in life? All those are great. I do want to encourage you this—and I'm going to specifically say maybe consider doing this as your big thing this year as your penance—specifically try to learn something new. To add to your intellectual formation. To be more educated about our Faith. Every year you know we have those Bible studies and there in the back; there's like 10 sheets for different bible studies, different times, different groups. Look through them and say: Is there a time, is there a group, is there a place, that I can make work?" Because you might think, "Well [a book study] doesn't sound very hard." But having to block out a certain amount of time? That is hard in our busy schedules. And it requires a certain discipline, more than just being like, "I'm going to be nice to people for Lent; I'm going go and do this act." Having to say, "I'm going to dive into this study. I'm going to read. I'm going to listen. I'm going to pray. I going to talk to other people when I don't want to talk to other people...and share." That is actually a great penance. When someone says, "You know I'm just better off giving up pop,"—and not taking anything away from that—but sometimes it might be a greater penance to be like, "No, I'm going to get a book. I'm going to watch a good show." You know we've had Formed.org for months—I showed you about a year ago—the online service. Go there. Every year they're adding new stuff at Lent. Go to Formed.org. The code is still on our bulletin. Just take that little code put it in; it takes less than one minute to sign up for if you haven't already. And that would be a great way to help your kids. Maybe you're like, "I don't think I can tell my kids, 'No television,' you know, given their age." Fine. Then say, "For every hour of Peppa Pig you're going to watch, well let's also watch an hour of something on Formed.org." And then do it to yourself. For every half hour "Parks and Rec" or "Friends" that you watch on Netflix say, "I'm going to watch a little half hour show or I'm going to listen to a little 30 minute thing on Formed.org." Or spend the time on Catholic Radio or someplace else. Challenge yourself. If all you've ever done is simply give something up, or even do something extra—taking nothing away from that!—try something new, different, maybe scary, and say: "What can I learn? What kind of formation can I have? What kind of things can I pull to build myself up in that way?" Look for ways of understanding the story better. Look for ways of understanding the victory of God better. Take that in and soak that in. I have one last thing, and it doesn't connect, and that's why I just took a big breath—because it doesn't connect with my flow at all. I do want to say this: Another thing that you can consider is having Masses offered. We always have room for more Masses. (We've gone through all of our All Souls' Day Masses.) Having a Mass offered—and then specifically if you’re coming to that Mass—is a great way of saying, "I'm not just saying I'm going to pray more," I've made it concrete. And I'm praying for someone who is important me. I'm making a sacrifice for someone important me. So contact Peg at the office let her know someone that you want to pray for. It doesn't have to be a deceased person. It can be a person in trouble; it can be a person who's suffering; it can be a person who's away from the faith. It can be just a special intention. Put that in and then maybe especially say, "And I'm going to attend that Mass also." That's an extra little sacrifice: an external thing we do, that we don't normally think about in Lent, but might be a great way to build up our mind not just in learning about Jesus but also celebrating the victory he had in Lent and Easter.